WASHINGTON (Reuters) - Escalating and sustained trade conflicts following U.S. tariff actions threaten to derail economic recovery and depress medium-term growth prospects, the International Monetary Fund warned on Monday. 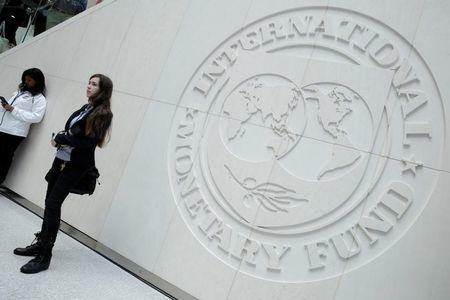 Sketching out potential damage from the full brunt of U.S. President Donald Trump's tariff threats and subsequent retaliation from trading partners, the IMF said that if realized, these could reduce annual global economic output by 0.5 percent from projections for 2020. That translates to nearly $500 billion in lost annual output based on IMF projections, the equivalent of subtracting an economy the size of Thailand. "The risk that current trade tensions escalate further with adverse effects on confidence, asset prices and investment is the greatest near-term risk to global growth," IMF Chief Economist Maury Obstfeld told a news conference, noting that U.S. trade deficits are likely to grow due to high demand, possibly inflaming trade tensions further. The reduction in output takes into account active U.S. global tariffs on steel and aluminum, as well as an initial $34 billion in Chinese goods, along with retaliatory measures. Other threatened actions, which include another round of tariffs on an additional $200 billion in Chinese goods and a 25 percent U.S. global tariff on car imports now under study, are also included. "As the focus of global retaliation, the United States finds a relatively high share of its exports taxed in global markets in such a broader trade conflict, and it is therefore especially vulnerable," Obstfeld added. The IMF left unchanged its global economic growth forecasts at 3.9 percent for both 2018 and 2019, compared to its previous forecast issued in April. Obstfeld said these projections only take into account tariffs currently in force, so larger actions such as possible automotive tariffs were not included. Still, he said that growth momentum was slowing. While the IMF in April rounded down growth projections to reach the 3.9 percent forecast, for the July update, the numbers were rounded up slightly to reach that same level. Forecasts for the United States and China were both unchanged, with U.S. growth pegged at 2.9 percent in 2018 and 2.7 percent in 2019. China's growth was forecast at 6.6 percent in 2018 and 6.4 percent in 2019. But the fund cut its 2018 growth forecasts for euro zone countries and for Japan and Britain, citing a softer-than-expected first-quarter performance coupled with tighter financial conditions partly due to political uncertainty. The euro zone's 2018 growth forecast was cut to 2.2 percent from 2.4 percent, with Britain cut to 1.4 percent from 1.6 percent. Japan's growth projection was cut to 1.0 percent from 1.2 percent. The fund also cut India's growth rate by a tenth of a point to 7.5 percent due to the negative effects of higher oil prices on domestic demand and faster-than-anticipated monetary policy tightening due to higher inflation. The IMF revised slightly upward 2018 forecasts for Saudi Arabia and several Commonwealth of Independent States countries other than Russia.